I've searched around and haven't really found a clear answer as to when you'd want to use .First and when you'd want to use .FirstOrDefault with LINQ. When would you want to use .First? Only when you'd want to catch the exception if no results where returned? And when would you want to use .FirstOrDefault? When you'd always want the default type if no result? And for that matter, what about Take? I would use First() when I know or expect the sequence to have at least one element. In other words, when it is an exceptional occurrence that the sequence is empty. Use FirstOrDefault() when you know that you will need to check whether there was an element or not. In other words, when it is legal for the sequence to be empty. You should not rely on exception handling for the check. (It is bad practice and might hurt performance). Finally, the difference between First() and Take(1) is that First() returns the element itself, while Take(1) returns a sequence of elements that contains exactly one element. .First will throw an exception when there are no results. .FirstOrDefault won't, it will simply return either null (reference types) or the default value of the value type. (e.g like 0 for an int.) The question here is not when you want the default type, but more: Are you willing to handle an exception or handle a default value? Since exceptions should be exceptional, FirstOrDefault is preferred when you're not sure if you're going to get results out of your query. When logically the data should be there, exception handling can be considered. .First() will throw an exception if there's no row to be returned, while .FirstOrDefault() will return the default value (NULL for all reference types) instead. So if you're prepared and willing to handle a possible exception, .First() is fine. If you prefer to check the return value for != null anyway, then .FirstOrDefault() is your better choice. But I guess it's a bit of a personal preference, too. Use whichever makes more sense to you and fits your coding style better. Returns first element of a sequence. It throw an error when There is no element in the result or source is null. you should use it,If more than one element is expected and you want only first element. Returns first element of a sequence, or a default value if no element is found. It throws an error Only if the source is null. you should use it, If more than one element is expected and you want only first element. Also good if result is empty. 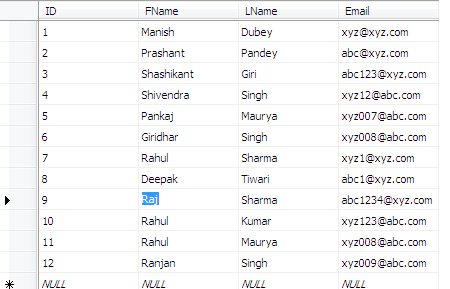 There are multiple records where FName == "Rahul". First record should be return. There is no record with ID== 13. An error should be occur. Hope it will help you to understand when to use First() or FirstOrDefault(). First of all, Take is a completely different method. It returns an IEnumerable<T> and not a single T, so that's out. Between First and FirstOrDefault, you should use First when you're sure that an element exists and if it doesn't, then there's an error. By the way, if your sequence contains default(T) elements (e.g. null) and you need to distinguish between being empty and the first element being null, you can't use FirstOrDefault. Another difference to note is that if you're debugging an application in a Production environment you might not have access to line numbers, so identifying which particular .First() statement in a method threw the exception may be difficult. The exception message will also not include any Lambda expressions you might have used which would make any problem even are harder to debug. That's why I always use FirstOrDefault() even though I know a null entry would constitute an exceptional situation. When you know that result contain more than 1 element expected and you should only the first element of sequence. FirstOrDefault() is just like First() except that, if no element match the specified condition than it returns default value of underlying type of generic collection. It does not throw InvalidOperationException if no element found. But collection of element or a sequence is null than it throws an exception. If there are no results to a query, and you want to to call First() or Single() to get a single row... You will get an “Sequence contains no elements” exception. Disclaimer: I have never used LINQ, so my apologies if this is way off the mark. someList.First(); // exception if collection is empty. Which one to use? It should be decided by the business logic, and not the fear of exception/programm failure. For instance, If business logic says that we can not have zero transactions on any working day (Just assume). Then you should not try to handle this scenario with some smart programming. I will always use First() over such collection, and let the program fail if something else screwed up the business logic. I would like to see others comments over this. This type of the function belongs to element operators. Some useful element operators are defined below. We use element operators when we need to select a single element from a sequence based on a certain condition. Here is an example. First() operator returns the first element of a sequence after satisfied the condition. If no element is found then it will throw an exception. FirstOrDefault() operator returns the first element of a sequence after satisfied the condition. If no element is found then it will return default value of that type. Ok let me give my two cents. First / Firstordefault are for when you use the second constructor. I won't explain what it is, but it's when you would potentially always use one because you don't want to cause an exception. linq many ways to implement single simple query on collections, just we write joins in sql, a filter can be applied first or last depending on the need and necessity. Here is an example where we can find an element with a id in a collection. To add more on this, methods First, FirstOrDefault, would ideally return same when a collection has at least one record. If, however, a collection is okay to be empty. then First will return an exception but FirstOrDefault will return null or default. For instance, int will return 0. Thus usage of such is although said to be personal preference, but its better to use FirstOrDefault to avoid exception handling. Not the answer you're looking for? Browse other questions tagged c# .net linq . Why use First instead of FirstOrDefault in LINQ? FirstOrDefault(), SingleOrDefault(), Any(), etc… Which One Is The Fastest? How to retrieve first row from dictionary in C#? How do i handle .FirstOrDefault method?